Yesterday I was setting up my new Macbook Pro 15inch with all my Crunchify Tutorials. I usually use Maven all over the place. Without maven pom.xml file I can’t even start working on my project. Maven is so convenient tool for building Java project, I wouldn’t think project without it. It took long time to import all of my Java Projects to new Eclipse Workspace. While importing all of my Maven Projects to Eclipse, somehow few of the .jar files got corrupted. After import finish I noticed few errors under Problems tab in Eclipse. How to identify an issue? On you computer, visit path: /Users/app/.m2/repository/org/springframework/spring-webmvc/4.1.1.RELEASE. 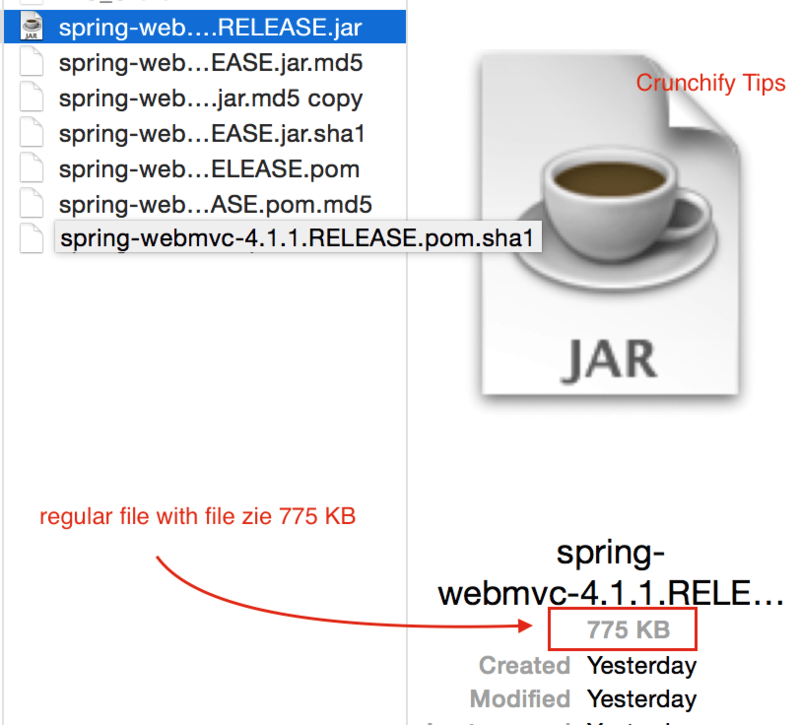 You should be able to tell by looking at spring-webmvc-4.1.1.RELEASE.jar file size. In my case it was just 32 bytes. File shouldn’t be that small. How to fix an issue? Close/Open the project in Eclipse. Error may go away – didn’t work for me. Exit/Open Eclipse. Error may go away – didn’t work for me. In my case, I’ve deleted directory 4.1.1.RELEASE as mentioned in above image. How to verify if issue is resolved now? 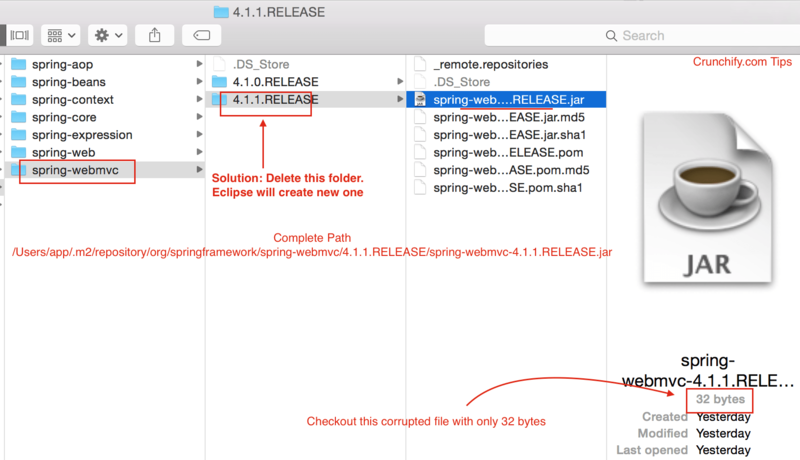 Once you perform Update Project… steps in Eclipse, Eclipse would re-download the version 4.1.1 for your and you should see correct file this time. It was 775 KB this time.